This week several bloggers are participating in Share a Story - Shape a Future, a weeklong blog tour for literacy. It's a way for bloggers share ideas on ways to raise a reader and support children's literacy efforts. I'm excited to host a giveaway sponsored by GoodNites brand of sleep pants in conjunction with this event. A good story draws attention. Parents can use storytelling to increase interest in reading and books. Storytelling goes hand in hand with reading and literacy development because oral communication provides the basis for beginning reading. Children that tell stories increase their understanding of word development and grow their vocabularies. Play with Finger Puppets [pdf] - Put on a puppet show with the finger puppets and have your child act out their own made up story. Use Template Word Games [pdf] - Create wacky stories by filling in the blanks of a short story with words and phrases. Read the story aloud together. Make Hand Shadows [pdf] - Tell a story and illustrate it with your hand shadows on the wall. The GoodNites brand of sleep pants also recently launched Bedtime Theater,™ a series audio bedtime stories available for free download online (CD versions are available in packages of GoodNites Sleep Pants). The story is about a boy Iggy and his exciting adventures with his magical bed. Along with listening to the story, families and storytellers can participate in the Iggy's Next Adventure Contest by creating a new adventure for Iggy and entering it in the contest. Only a story summary is required (approximately 275 words), so the contest isn't overly difficult to enter. Take a moment and enter your story idea for a chance to win the $2500 grand prize or one of the smaller weekly prizes. The contest ends on 4/15/2010. See the official rules for contest information. The Bedtime Theater helps parents establish a nightly bedtime story routine with their children and reduce anxiety around bedtime. According to Dr. Jennifer Trachtenberg, one of the GoodNites NiteLite experts, "having a regular evening ritual, such as a bedtime story, can quell nighttime issues like bedwetting and become an important step in building your child’s self-confidence." Even though the website is geared toward those needing help with bedwetting, all parents and children can enjoy the Bedtime Theater. As a way to spread the word about the GoodNites Bedtime Theater, activities and storytelling contest, GoodNites has kindly offered to give away a Bedtime Theater kit to a Brimful Curiosities reader. 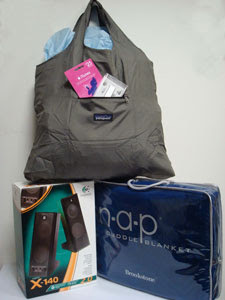 The kit is worth approximately $175 and includes an iPod shuffle, $25 iTunes Gift Card, Brookstone cuddle blanket, Patagonia bag and Logitech speakers. To enter, leave a comment with a storytelling activity idea or a description of how you have used storytelling with children. • Contest ends on Monday, March 29th, 2010 at 11:59 PM CST. It's always fun to take the tent out, camp in the living room in our pajamas, and read a suspenseful story. i use puppets...kids love puppets!!!!!!!! For now I use lots of different voices in my story telling. It help keeps the interest of an almost one-year old! I love asking questions during storytime - What is that? What is going to happen next? Do we do that? I want the kids to get involved and enjoy the stories we share with them. I used hand puppets (Pooh & a beehive) to retell the story of Winnie-the-Pooh and the Bees (Chapter 1 from Winnie-the-Pooh) for my preschool story time. The Kids loved. I loved it. I can't wait to try something like this again. I have had all the kids in my bed lights out and used a flashlight to read the story to make it scarier and we love the scary tales books. I always loved making crafts so finding a fun one to make that fits with a book would be great. That or eat a snack that works...ex. if the book is about the movies, use popcorn...if it's about the park, maybe a hotdog or something. Bedtime Theater have really added value to their product with these ideas. Wonderful to see companies getting on board with the literacy message. I listened to some of Iggy's story too, and it is very nicely done. Thanks for sharing, and for visiting The Book Chook! we like to do art projects after reading a story and use it for the next time we read the story! My son is at an age where he likes to make his own little story books (age 5). I take turns reading books with my daughter. I love hearing her tell the stories - it reveals what's in her imagination. I've had the kids in my Sunday School class draw what the story means to them after we have read it. I borrowed a blow up planetarium from a nearby university that would hold an entire class of students at one time. With the lights out in the classroom, I was able to shine pictures of different constellations of the ceiling of the planetarium. The students would try to trace the figure that that constellation was supposed to represent with their finger. I would then tell them the story of how that constellation got its name. We could only do at most two constellations for each class period and I tried to cover different constellations with each class. Each class period went by very quickly according to the students. I entered Iggy's Next Adventure Contest Adventure on March 10, 2010. One storytelling technique I like to try with young kids is to forget about the words every once and awhile and have them tell me the story, based on the pictures. It stretches their imagination to come up with what's going on and I'll prod them with questions. It's always quite entertaining! I've always liked dress-up storytelling. For a bedtime story, you could get dress-up or character pajamas. I love reading with my kids and we would all gather on the bed and take turns telling parts of our favorite books. As the kids got older we would pass the book around and read different parts. My son enjoys hearing "real" stories about things my husband and I did as kids and often asks us to tell the same ones over and over again. When a story is a favorite, we write it down on paper and let him draw pictures to go with it- then we have a new "book" to read together. I always loved playing the game where someone starts a story and the next person adds on a few sentences and you go around the room until someone finishes the story. We've used cut-outs or made our own pictures and told stories with flannel boards. I like doing popsicle-stick puppets - print or cut out pictures of the main characters in the story, glue them onto popsicle sticks, and let the little ones "act" out the story with their puppets. I'm still working on getting a theater stage put together from a display board. I really like to use my fingers to create animals from my hands shadow on the wall to use during storytime! I teach preschool now and I do storytelling regularly with my class! I teach 3K, and the 4K teachers and I have talked about brainstorming with our classes to have storytelling prompts, then the teachers get together and really ham it up with costumes and all, acting out the story as the kids create it. My family loves to write our stories and then read them together. We always use the front room, light a fire and turn off the lights pop popcorn get flashlights and play what would happen next. After reading a story to my 4 year old grandson he likes to draw pictures of the characters and the story lines. We keep a notebook and markers with his books for this purpose. I would love to win this for him. my daughter take turns collaborating on stories. i'll say the first sentence, then she'll continue with the second... we go back and forth. the results are always entertaining! We started telling stories with the light of the oil lamp one night during a power outage and the kids loved it. We sometimes have pretend "outages" now and shut off all electronics and tell stories. When my son was little I had to do the voices different for each character. Boy that was tough trying to remember the voice for each time I read the same book. I use lots of different voices in my story telling and use stuffed animals or puppets also. My almost 2-year old loves it! I like using hand puppets when telling a bedtime story. My god-children always a get out of it when they stay over on the weekends. I follow you on twitter & I tweeted about this giveaway. One of my favorite ways to do storytelling is to read a story in different voices. My dad did this with me and my siblings when we were younger and we absolutely loved it! I have used that fond memory in my current life today. Stories are always best by the fireplace with only the fire as your light...snuggled up nice and warm under the blankets with your loved ones! I get up and walk around to act out what I'm reading to him. My five year old daughter can read fairly well. So, she's taken over the storytelling at bedtime now (she has twin brothers that are seven). You can take a picture out of a coloring book and put it on the front of a small notebook and have that as the basis for telling (making up) a story. I ask "what if" questions to get stories started. It sounds weird but kids love it! Kids have amazing imaginations, so once you get them started they can develop elaborate stories in no time! I have a really nice reading voice. So for my son's first grade teacher I borrowed a bunch of books that she had in her class. I taped myself reading them. She would play them for the kids every day. She said it really calmed them down. we do fill in the blanks. I start then my son fills in, then my husband, then my daughter, etc. until we make our own story. When we go camping, which is almost every weekend in the summer, we always enjoy a campfire at night. As we're sitting around the campfire someone starts off with a story. The next person adds to it, and we keep going around the circle. The kids love to make it a wild story! We use things like felt boards in our storytelling, or we use our daughter's toys to help tell her stories. Using visual aids, and also saying and signing the words helps her connect with the story more, it seems. Thank you so much! I take turns with my son and daughter reading stories and if it's a nice day we go to the park. I follow Brimful Curiosities awesome blog via Google Friend Connect! My daughter especially likes when I tell her stories when she is scared. I sit on her bed and stroke her hair as I reassure her. The stories are always about her guardian angel. She loves it. I entered Iggy's Next Adventure Contest today, March 20. I like to make blank books and have my daughter write and illustrate her own stories. They are really priceless! We have lots of photo albums from when I was a kid until now. We look through them a make up stories about what might have been happening in the picture. I love to make up stories about my kids when I put them to bed. I also like to put their names into a classic story, and they think it's great! Storytelling is always a good way to get kids to settle down some before bedtime. If they look forward to storytelling they won't fight you quite so much. I do a lot of storytelling using a glove and pompoms plus asst. materials to create the characters of the book on each finger. As I read I hold up the finger/fingers of the corresponding character. I always liked to get my kids involved with the storytelling by adding their own ideas to the story. I encouraged them by asking them questions like, "What do you think happens next?" I entered Iggy's Next Adventure Contest on March 18th. Even though my boys could read them on their own, we read the Harry Potter series together. It was great snuggle time. My daughter and I use the days events to create outrageous stories. Like if we went to the zoo, we would say "Today we went to the zoo, there were 4 mermaids swimming together" type thing...we have a lot of fun with it. Thanks for the chance. Start by getting a picture of a place, object or animal - a drawing or a picture out of a magazine - and let them create the setting or characters. Then start making up the plot together. I used puppets or a stuffed animal to go with the story and usually have them pretend talking - using a high voice or silly voice. If I find online printables that correspond with the story, we print those out and color them. For the Snowy Day book, we did artwork...shaving cream and glue mixed together to make a puffy paint and then we made our own snowstorm on the paper. I LOVE kid's books! I worked in the children's department at a bookstore for years and I could go on for days! My favorite part of the job was helping people find presents! The children's section is overwhelming and daunting if you're just stopping in for a present for your favorite kid. I don't know which story to tell! I will say that I sold many, many copies of Leonardo the Terrible Monster by reading it out loud to adults! I have that one memorized. Thanks for reading my rambling post and for hosting this great giveaway! My niece and nephew are content just sitting while I read them a story. I do try to use funny voices though so it's amusing. Following you via Google Friend Connect, name is Bani. One of my favorite things right now is reading a story to my 3 year old son, then finding him later sitting with his 16 month old sister trying to read the same story to her. Every family member has their day for story telling. We get very creative and use props. I love to read story books to my little granchildren and encourage them to "read" back to me from picture books. They are very creative! Every night we have storytime before bed. Some nights I will let my daughter pick the book we'll read. Other nights, I make up a story using my daughter as the main character. I usually tell a story about what's going to happen during the next day so she can go to bed anticipating it or I'll tell a story and recap the day we've just had. It makes it fun and keeps the stories interesting. My daughter loves it when she is the character! She can't wait to hear about the adventures she's going to get to experience!!! Thanks for the giveaway opportunity!!! I am a new follower via Google Friends Connect! I like to tell stories to my kids, and then everyone draws a pic to go along with the stories. Some nights, rather than reading my son stories, I let him make up his own stories to tell me. It tweeted about this giveaway!! In the summertime our library has a Summer Reading Program where kids get prizes for reading a certain number of books. I take my kids to the library and let them choose their books, then we go home and I let them read to me. We also discuss the characters and plots. Thanks. We play pretend restaurant and the kids make up their own menus. I will show my son random photos or pictures and together we make up great stories. Just sitting together in a nice, cozy rocking chair and reading books is one of the best memories with my children and now it so great to be able to do the same thing with my grandchildren. I like to use sock puppets and stuffed animals to act out storybooks. my daughter loves it when i turn the lights out and use a flashlight and make animals out of my hands. She laughs cause i make up stories like One day a bunny rabbit went hopping up the hill to find a little doggie who had no tail. I love letting my 2 yr old fill in the blanks! Following on twitter as mrsmchappell and retweeted! I try to make the kids connect to the reading. I ask what they think about something, how they feel, what they think might happen next and why. I use story telling to clear my child's moind after he gets frustrated. I entered Iggy's Next Adventure Contest today. Reading under the blanket with a flashlight is always good for a fun time. You can't forget the funny voices either. It's fun to have the child pick a character and a place and you make up a story with those elements. I always did different voices for stories. I try to really engage my little one - he's three by asking questions and making comments on the story and encouraging them from him. I've had story ideas for kids books but haven't written them down yet. btw - my word verification word is flurk - that's going to stick in my head all day I'll bet! I entered their fun contest today! March 28th. Wow, it was kinda cool writing a synopsis for a story I've been playing around with in my head for so long. I've written other stories but not that one! I kind of wrote it like a long blurb for a book cover. A storytelling activity idea we have is to act out the story with stuffed animals. My kids love it and it the stories tend to stick with them. we had a camp in our livingroom with our lamps and had stories, marshmallows, hotdogs and a good time! I read to my son every night. He's only 4 months old, but I've already read the whole of Beowolf, Harry Potter, and a few others to him. He probably doesn't understand a word of it, but its a great way to wind down before bed and he seems to enjoy sitting with me and listening. I hope he enjoys it as much when he can start understanding what I'm saying. We love going outside at night, and having story telling time around a fire. It is so peaceful where we are its very relaxing. I read short stories to my very active toddler. She enjoys going to the library too for storytime. My 6 yr. old is a drama queen! A few years ago she would always say that she was hurt or that she needed me to come to her right away. I used storytelling to teach her how dangerous it was by telling her the story of "The Boy Who Cried Wolf". It got the point across and she still remembers it today!! If you have a few kids, it's good to have each person tell a part of the story and the next person continues. When we take our 2 grandkids (ages 2.5 and 6)in the car I will always start telling a story about what we can see out the car window. Then I ask them where is the blue car going? What is the truck doing? The now 6 year old can carry on with the story if she wants. Sometimes we take turns on telling parts of the story. The 2 year old is more involved now. He'll tell me something he see (red car) and want me to put it in our stories.If he doesn't like what the red car is doing he'll have me change the story. Brimful Curiosities public follower via Google - I was #500!!! We read all the time, but usually Saturday nights we have a campy sort of storytelling time. Where we pretend all sorts of great stories and each person gets to tell a story just as the like it. Its great fun. I think when they are little you read with gusto, when they are older you can help them to make up their own stories when putting up toys, or sitting in a Doctor's office. One of my granddaughters favorite things to do these days is write plays using her Barbie's. We read at bedtime every night together and I try to tell the story using different voices for each of the characters in the story. My son thinks this is funny.